Collagen fibers are the primary structural elements that define many soft-tissue structure and mechanical function relationships, so that quantification of collagen organization is essential to many disciplines. Current tissue-level collagen fiber imaging techniques remain limited in their ability to quantify fiber organization at macroscopic spatial scales and multiple time points, especially in a non-contacting manner, requiring no modifications to the tissue, and in near real-time. Our group has previously developed polarized spatial frequency domain imaging (pSFDI), a reflectance imaging technique that rapidly and non-destructively quantifies planar collagen fiber orientation in superficial layers of soft tissues over large fields-of-view. In this current work, we extend the light scattering models and image processing techniques to extract a critical measure of the degree of collagen fiber alignment, the normalized orientation index (NOI), directly from pSFDI data. 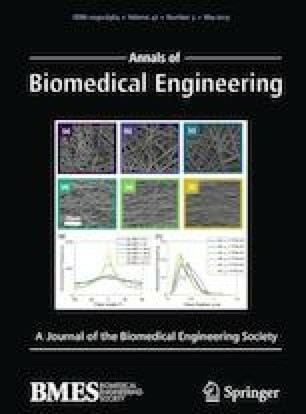 Electrospun fiber samples with architectures similar to many collagenous soft tissues and known NOI were used for validation. An inverse model was then used to extract NOI from pSFDI measurements of aortic heart valve leaflets and clearly demonstrated changes in degree of fiber alignment between opposing sides of the sample. These results show that our model was capable of extracting absolute measures of degree of fiber alignment in superficial layers of heart valve leaflets with only general a priori knowledge of fiber properties, providing a novel approach to rapid, non-destructive study of microstructure in heart valve leaflets using a reflectance geometry. This work was supported by funding from the National Heart, Lung, and Blood Institute of the National Institutes of Health (awards RO1-HL108330 and RO1-HL129077), the National Institute of Biomedical Imaging and Bioengineering of the National Institutes of Health (Award T32-EB007505), and the Cancer Prevention and Research Institute of Texas (Award RP-130702). The authors would also like to thank Mason Dana for his contributions to data collection and instrumentation troubleshooting, and acknowledge the Microscopy and Imaging Facility of the Institute for Cellular and Molecular Biology at The University of Texas at Austin for use of their electron microscope facilities. There are no conflicts of interest from financial or other commercial benefits related to the development of this manuscript. (A5) shows that the intensity response detected by the camera is now entirely dependent on the linear polar response, and the Stokes vector can therefore be collapsed into Eq. (6). In this form, a linearized representation of the reflectance is I = Sb, where I is the detected reflectance intensity, S is the Fourier expansion representation of the model in (A6), and b is a vector containing the five transformed model coefficients from (A6). Solving this system of equations by b = S\I allows extraction of the coefficients by Gaussian elimination (Matlab function mldivide). Subsequently, a 1 s fitting time was achieved for a 1.5-megapixel image, compared to several hours with the lsqnonlin fitting algorithms for the original equation containing a non-linear phase offset term. After fitting, the original form of the model coefficients and phase offset were recovered using the same identities.